If you’ve listened to a streaming radio service such as Pandora, Spotify, or Radical.fm, you will grok Apple’s new iTunes Radio on the iPad mini immediately. 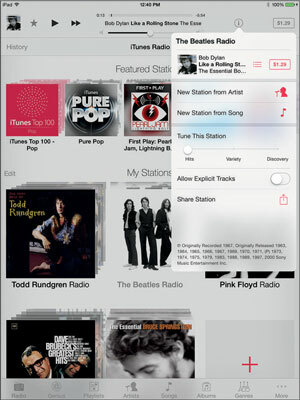 In a nutshell, iTunes Radio features more than 300 DJ-curated and genre-focused streaming radio stations. You can also create your own stations based on music you love. The more you listen to and fine-tune stations — by tapping the Play More Like This or Never Play This Song button (you’ll hear more on these important buttons in just a moment), the more you’ll like what the station plays for you. iTunes Radio is available on your iPhone, iPad, iPod touch, Mac, PC, and Apple TV for free. You’ll hear the occasional ad, but if you subscribe to iTunes Match ($24.99 a year; see the upcoming sidebar for details), you can listen ad-free. But enough about what it is. Tap the Radio icon at the bottom of the Music app and to start listening, tap a featured station. A song begins playing immediately. Featured: iTunes created these stations. You find these stations at the top of the screen; swipe left on the featured stations to see additional choices. At this time, you can’t customize these stations. What you see is what you get, but the featured stations are updated frequently with new additions. Custom: You create these stations, and they’re listed under the featured stations. 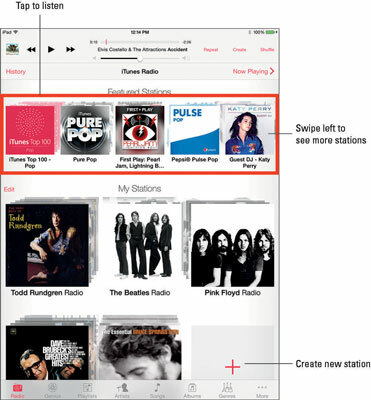 While featured stations are nice to try out, custom stations are the heart of iTunes Radio. Tap the New Station button to start a station of your own. You can then search for an artist, a genre, or a song. Tap an artist, a song, or a genre (or any combination), and your station is created based on your choice. If you ever need to edit your custom station, tap the red Edit button to the left of My Stations. You can rename the station; add artists, songs, or genres; or delete the station from your iPad. Deleting a station on your iPad deletes the station everywhere: from your Mac or PC, Apple TV, and other iDevices. If you’ve put a lot of time and effort into fine-tuning a station, think twice before you delete it because once it’s gone, it’s gone forever. If you want stations you create to play more songs you like, you need to fine-tune the stations. When a song you love or hate is playing, just tap the little star on the left of the play/pause button. Three options slide up from the bottom of the screen. If you love the song, tap Play More Like This or Add to iTunes Wish List (or both). The star turns red when you choose Play More Like This. If you hate it, tap Never Play This Song, and you’ll never hear it again (at least, not on this station). When you’re done, tap anywhere outside of the overlay to dismiss it. You can’t fine-tune songs played on featured stations; you can add them to your wish list, but you can’t select Play More Like This or Never Play This Song for them. When you find any item in the iTunes Store and want to add it to your Wish List, click the arrow to the right of the Buy button and choose Add to Wish List. To view or change your Wish List, click the iTunes Store and then click the Lists button next to the Library button in the upper-right corner of the iTunes window and then click the Wish List tab (or click My Wish List in the Quick Links section). What you can do — and this works with songs on both featured and custom stations — is tap the little i-in-a-circle near the top of the screen to display the song’s Info overlay. When you’re done with the Info screen, tap anywhere outside of the overlay to dismiss it. The Info overlay lets you start a new station from the artist or song that’s playing, allow or disallow explicit content on the station, and share the station with friends via the usual methods. The Tune This Station slider appears only for custom stations; you can’t tune a featured station. Adjust it to hear more hits, get more variety, or discover more new artists and tracks. Clear as mud? You can also tap the song title to see all the tracks on the album in the iTunes Store, or tap the price to purchase the track that’s playing. Even though you can’t tune a featured station, you can start your own custom station based on a song or artist you hear on a featured station.